Total 8 Screens, All Screens support Digital J2k Format. Screen 1 - 186 Seats | Screen 2 - 148 Seats | Screen 3 - 243 Seats | Screen 4 - 166 | Screen 5 - 166 Seats| Screen 6 - 318 Seats| Screen 7 - 200 Seats| Screen 8 - 199 Seats. There are Total 8 screens in PVR Cinemas, Elante Mall, Chandigarh. All screens support Digital J2K Format. Below are the screen wise details in terms of capacity per show. 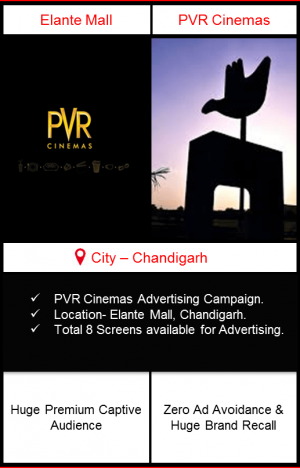 Minimum 3 rotations are committed per screen per day if the client has selected one rotation per show & Minimum 6 rotations (3+3) are committed per screen per day in PVR Cinemas, Elante Mall, Chandigarh if the client has selected two rotations per show. 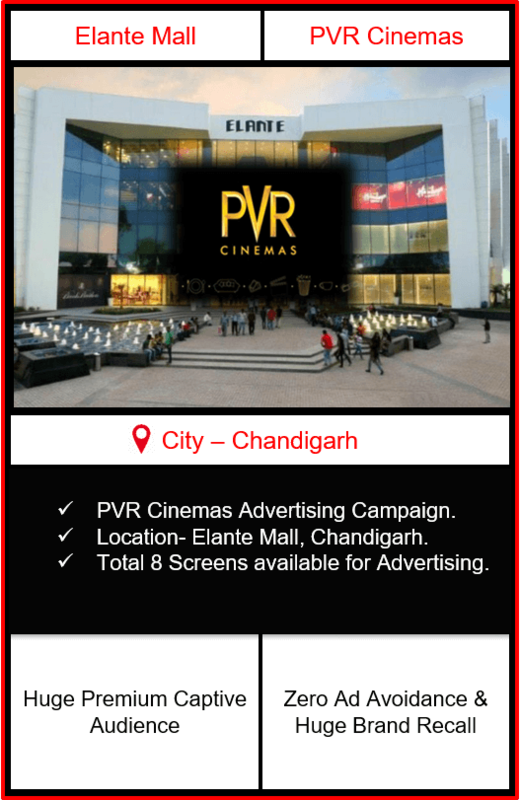 There are total 8 Screens in PVR Cinemas, Elante Mall, Chandigarh which ensures that minimum 24 or 48 rotations would run per day as per the rotations’ selection per show by the client. Total rotations per day would vary from 24 – 45 (48 – 90 in case of the client selecting two rotations per show) on all 8 screens combined if selected depending upon the inventory available for the upcoming week. Generally higher inventory ensures an average 40 rotations per day (80 rotations if the client selects 2 rotations per show) while lower inventory (usually in the case of a blockbuster movie) ensures an average 30 rotations (60 rotations if the client selects 2 rotations per show) per day in all 8 screens combined if all are selected. Cinema advertising has been extremely effective when it comes to capturing the audience’s attention. The distinctive advantage of cinema advertising is that your audience is captive, local and completely focused on the screen. Unlike TV and radio, no one can change the channels. A local ad on the screen is effectively watched and absorbed by the huge audience without distraction. Suitable to reach out to a small geography as well as the complete country. 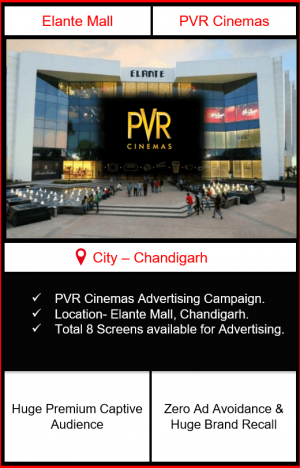 Why advertise in PVR Cinemas?